This page describes using the Break In Class Module setting in your VBA Code. When you are testing and running your code, you have three error trapping modes. The first is Break On All Errors. This will cause the debugger to open if any error occurs, regardless of any On Error handling you might have in the code. The second option is Break On Unhandled Errors. This will cause the debugger to open if the error is not handled by an existing On Error directive. This is the most often used option and is the default setting. The third option, Break In Class Module is the most important and least used. It is not the default error trapping mode, so you have to set it manually. The Break In Class Module is the most important because it will cause the debugger to break on the line of code within an object module that is actually causing the problem. The Break In Class Module setting is in the Options dialog accessible on the Tools menu. It is on the General tab of the Options dialog, as shown below.
' Force an error for illustration. If Break In Class Module setting in effect, the debugger would take you to the Debug.Print statement within the userform's object module, as the cause of the error. If the setting is something else, the debugger would take you to the line where the form is displayed with the Show method, masking the true cause of the error. 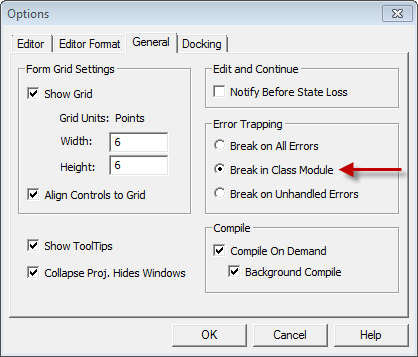 There is absolutely no reason to use an error trapping setting other than Break In Class Module. This page last updated: 27-Oct-2012.